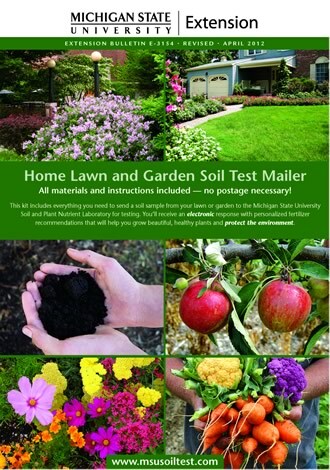 Obtain an MSUE Home Lawn and Garden Soil Test Mailer. Decide which one lawn or garden area you would like to test. Use a spade or a trowel and a clean plastic pail. Collect 10 random soil samples from this lawn or garden area. Each of these samples should be about 1/2 cup. To do so, remove a slice of soil (extending to the bottom of the plant roots 3 inches deep for lawn; 7 inches deep for all other plants). Do not include roots, thatch or other plant materials in the sample. Mix the 10 sub-samples together. If the soil is wet, spread it on paper and allow to air dry overnight before filling the sample bag. Do not use artificial heat (i.e. radiator, oven, microwave, hair dryer, etc.) to force-dry the sample. Place roughly 1 cup of the well-mixed soil inside the resealable plastic bag that is included in the Soil Test Mailer and seal carefully. Do not overfill the plastic bag. Do not pour extra loose soil inside the white postage-paid envelope. Farm, landscape, lawn maintenance, nursery, athletic field and other commercial operations or those who wish to test soil for wildlife plots should contact their local MSU Extension office (click here for a list of county offices) or the Soil and Plant Nutrient Laboratory by calling 517-355-0218 or visiting www.spnl.msu.edu for soil testing instructions and costs. You will receive an email (and text message if you opted-in) within 10 days after your sample is received at the MSU Soil Nutrient and Plant Lab letting you know your results are available at this website. A link directly to your report will be provided in the email and text message, or you can use the unique Report Code that is also sent. If you submit your sample without an email address, it will take slightly longer for you to receive your results in the mail.